BMW has revealed its new X5 SUV (or SAV - sports activity vehicle - as it prefers to be called) ahead of sales starting in the UK later this month. The X5 competes with the likes of the Mercedes-Benz GLE, Audi Q7 and Jaguar F-Pace. It's now in its fourth generation with a new platform (shared with the BMW X7) and gets modest styling updates. We'll address those styling updates first, as you could be forgiven for thinking the new X5 looks very much like its predecessor. But those larger front kidney grilles make it appear almost as aggressive as the new X7 (almost), while the rear bears more than a passing resemblance to the smaller X1. It's huge, too - longer, wider and higher than the old model, meaning there's all the interior space a modern family could possibly want. There's 645-litres of boot space, while dropping the 40:20:40 split rear seats increases that to 1,860 litres. A split rear tailgate aids access, while the optional Comfort Access feature allows you to open both sections hands-free. Even the boot floor drops electronically when required to increase space. Like its predecessor, the new X5 can also be specified with an extra pair of seats in the boot. Of course, BMW's once-flagship SUV isn't short of technology. Adaptive cruise will now sit in stationary traffic for up to 30 seconds before the driver has to nudge the accelerator to move forward, while the new Lane Change Assistant will hold the steering in your lane until you indicate to initiate a lane change. There's even a Reversing Assistant, which controls the steering to manoeuvre the X5 back along a path recently negotiated forwards. It can retain the steering movements made during the car's last forward manoeuvre for long periods, meaning the system can reverse the new X5 out of a parking position that it drove into forwards the day before. At launch, buyers will be able to choose from one petrol and two diesel engines, with a plug-in hybrid version expected at a later date. 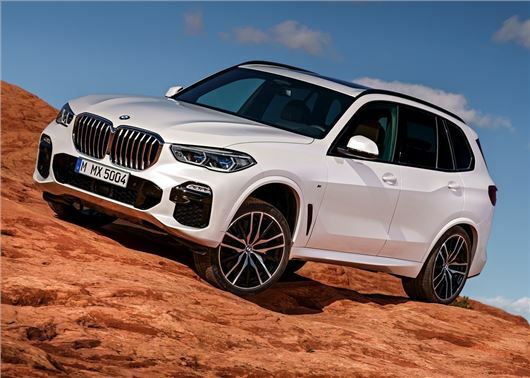 The entry-level X5 xDrive30d xLine starts at £56,710 and is powered by a 3.0-litre straight-six diesel engine producing 265PS and 620Nm of torque. It'll hit 62mph in 6.5 seconds with a combined MPG of 47.1 and CO2 emissions of 158g/km. Buyers after a petrol will opt for the xDrive40i xLine, with its £58,100 price tag and 3.0-litre straight-six petrol engine. The petrol has a power output of 340PS and produces 450Nm of torque, taking it to 62mph in 5.5 seconds. Fuel economy and CO2 are 33.2mpg and 193g/km respectively. The current top-spec M50d costs £70,690 and is powered by a 3.0-litre twin-turbocharged straight-six diesel engine delivering 400PS and 760Nm of torque. It covers 0-62mph in 5.2 seconds and has official economy of 41.5mpg while CO2 emissions are 179g/km. BMW dealers will take orders for the new X5 from later in June 2018.